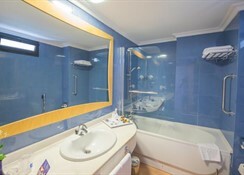 The Faro Jandia Hotel is located in a tranquil area of Playa de Jandia, facing the famous lighthouse on the stunning beach and close to Jandia''s tourist and shopping area. Close to the little harbour town of Morro Jable, this property is a mix of magnificent architecture, well designed interiors and first-class service. Any type of visitor seeking to get away from it all will appreciate the comfortable twin guestrooms well equipped with modern amenities and close to a host of activities. 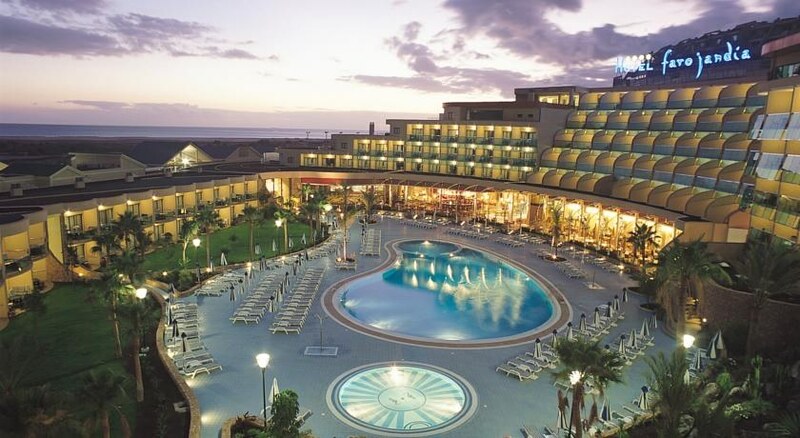 Guests to the 4 Star Faro Jandia Hotel can discover quaint towns, enjoy exciting water sports, and experience the Island''s exuberant natural life. 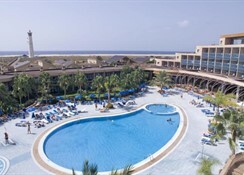 Fuerteventura Airport is 75 km from the Resort. Local Tips: The picturesque village of Morro del Jable is easily accessible by public transport (there is a bus stop in front of resort) as well as by walking along the beach promenade. An 18-hole golf course, bike rental and water sport stations are nearby. Food, drink and entertainment: Half Board accommodation. 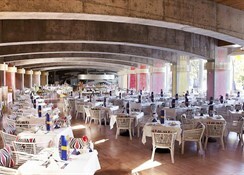 The Faro Jandia has a main restaurant for breakfast and dinner with an outdoor terrace, a pool-side restaurant, and a friendly bar lounge. Sports, games and activities: Outdoor swimming pool (heated in winter), sun chairs, sun shades and pool towels for free, children''s pool (heated in winter), playground, complementary fitness centre and SPA with Finnish Sauna, Turkish Bath, Kneipp, etc., massages and treatments (with extra charge), mini golf (with extra charge), tennis school and 3 tennis courts (with extra charge), plenty of sports facilities in the surroundings (surfing, golf, etc.). Additional: 24 hour reception, currency exchange, room service, air conditioning in all public areas, free access to Wi-Fi in bar area, Wi-Fi access (with charge), Internet terminal (fee), free parking (space is limited). Christmas Day and New Year''s Eve Gala meals with supplement (mandatory). 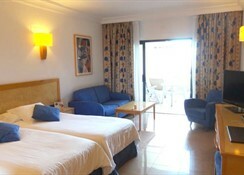 The Faro Jandia features twin rooms that can accommodate up to 3 people and also be booked for single use. Rooms have either a pool view or Sea view. All rooms have a bathroom with hair dryer, individual air conditioner, direct dial telephone, Satellite TV, mini bar, safe, water heater with varied choice of tea and coffees, and a furnished balcony. Connecting rooms are available on request. All Inclusive: The All Inclusive programme consists of breakfast, lunch and dinner, snacks throughout the day, ice cream for children, afternoon tea and cakes, soft drinks and locally produced alcoholic and non alcoholic drinks from 10am to 11pm. 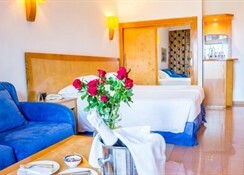 The hotel is next to the beach and overlooks the Jandia lighthouse. There are many shops, bars and restaurants within walking distance of the hotel as well as a nightclub and the nearby Jandia golf course. The bus stop which stops in front of the hotel is very handy for visiting other areas.